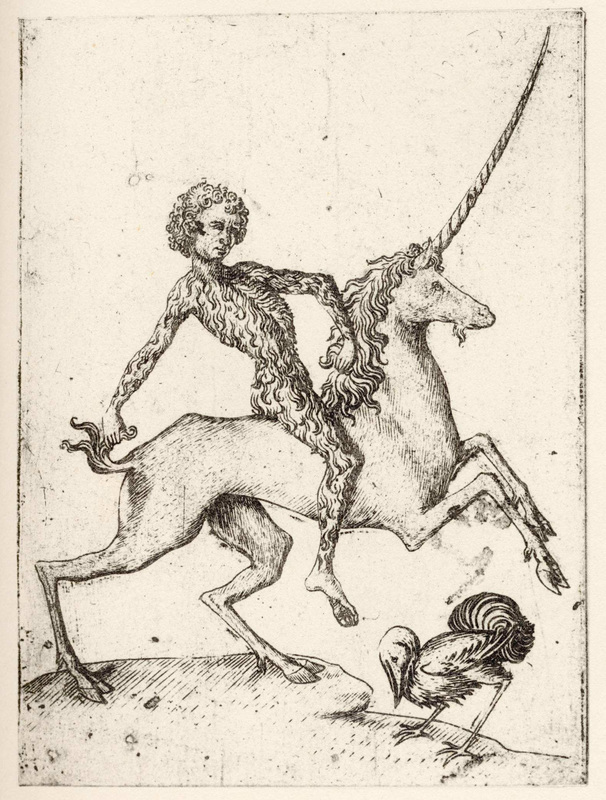 This wonderful image of the Wild Man of the Wood riding a unicorn appears to be an image from a playing card, or tarot card from Germany around the middle of the 15th Century. The Wild Man of the Woods is a mythical figure that appears in the artwork and literature of medieval Europe, comparable to the satyr or faun type in classical mythology and to Silvanus, the Roman god of the woodlands. Wild men were so frequently depicted in medieval art that some historians have suggested that they may have actually existed, maybe being primitive tribes that have since died out. There’s certainly a lot of similarity between the images of wild men and more recent depictions of the wolf man.